If you have taken a train to Lhasa, along your way you can see the Tibet's magnificent snow-covered scenery and the Tibet plateau, then what about taking a short train tour from Kunming to Dali. Taking the fast train from Kunming to Dali is now available to passengers. In the past, there were no fast trains opening to traffic. Usually, people have to take the normal train or the expressway, and it took a longer time and it would stop at many places. The new fast train shortened the stop time and is safer than before. Tourists today can take the new fast train from Kunming to Dali directly, making travel between Kunming and Dali more convenient and efficient. The new fast train numbers all start with the letter "K". Letter "K" means the fast passenger train line. "K" is the start letter of Kuài (快), Kuài meaning fast in Chinese. These K lines just stop at prefecture-level administrative centers or the county administrative centers. There are air conditioners on the train. So passengers can have a comfortable time on the train whenever the season is. Now, tourists can take the K9614 (07:58 hours), K9610 (06:45 hours), K9622 (07:50 hours), K9626 (07:58 hours) to Dali. The price is around 100 RMB. Most of these K lines are red in cover, and a number are in green, another way to tell whether you are taking the fast train. During the train is bound for Dali, you can view the beautiful landscapes of Yunnan. The train passes the peaceful countryside. Yunnan is rich in tourism resources, with beautiful natural scenery and a pleasant climate, making the whole province an important tourist destination. While you are on the fast train bound for Dali, you can feel the efficient transport that brings people to a new time. Tourists nowadays can visit various destinations by fast train, which is really a good choice to choose the train as your travel mode for it is fast and efficient. After about 8 hours on the train, you can step on the ground of amazing Dali. Renowned as an ancient town, Dali welcomes you to see its magnificent Erhai Lake, and the peaceful river Lijiang. There is a phrase called 风花雪月(Fēng huā xuě yuè) in Chinese that matches this place well. This phrase contains 4 scenes - Feng (wind), hua (flower), and xue (snow), yue (moon). It means the place is heavenly. This phrase is used to describe beautiful and natural scenes in poems before. Now, people use this to give a nomination to Dali. 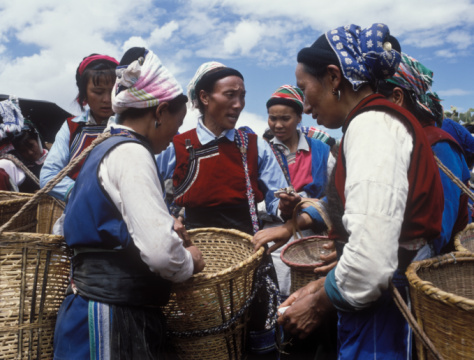 In this ancient town, tourists not only enjoy the beautiful and unique scenery of Yunnan, but also get close to the brilliant culture of Dali. My daughter can't wait to get her ticket bound for Dali and will be holding her breath until she gets one this summer. Just pack your backpack and take the new fast K line, and Dali awaits you this summer!